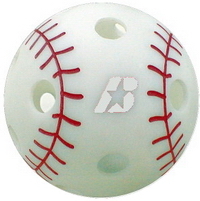 Seamless, perforated plastic baseball have thicker wall structure for increased durability. 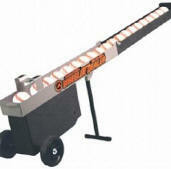 Great for soft-toss drills indoors and outdoors or batting off tees in gym. This is a hitting aid designed for all ages and all genders alike. It is designed to assist you with hand speed when swinging the bat. The RBI Pro Swing will teach everyone the proper hitting technique and hand position during the impact point of the swing. The RBI Pro Swing began as an idea when a father determined to help his son with his swing. Over the years and the many coaches, there was one central theme emphasized to all the youngsters when approaching the plate. "Quick hands, quick hands!" Everyone in baseball can agree on this one idea through all levels. Thus the RBI Pro Swing was born. "With its dual purpose of a swing trainer and on deck weight, there is no better tool for getting loose in the on deck circle while you continue to train yourself just before stepping into the batter's box." "If you want immediate feedback on your swing path, the RBI Pro Swing is the best tool I have used."